Your feet play a pivotal role in your running action. They help to propel you forward, and they offer you support, balance and mobility. Each foot is made up of 28 bones, 30 joints and more than 100 muscles, tendons and ligaments. The band of tissues (ligaments) supporting the arch of your foot, connecting your heel bone to your toes, is known as the plantar fascia. The muscles, tendons, bones and ligaments of the feet will all strengthen as you run. But this adaptation process takes time if you want to avoid most of the runner’s foot injuries. It is therefore crucial that any increase in the number of miles you run is incremental. The usual recommendation is to increase your training load by no more than 10% in any one week. 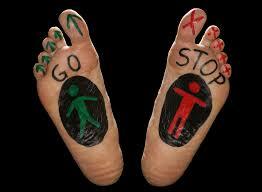 And to help avoid injuries to the feet, vary the type of surface you run on. If you run exclusively on pavements and tarmac, you are asking for trouble. Experiment with park running, track running, treadmills and even aqua-jogging as possible alternatives. A blister is a sack of fluid in the foot. It can be red if it’s a blood blister, but usually, it is a clear liquid. They are caused by repetitive friction between the socks and feet. They are often a result of wearing the wrong shoes or having the wrong sock fabric. To help prevent them you should wear proper running socks, and avoid cotton. The best running socks are made from synthetic materials such as polyester and/or acrylic. These fibres take moisture away from the surface of your skin. Try ‘Twin-skin’ socks, they help absorb friction and reduce blistering. Also, check your shoe size, and seek out advice from a professional sports shoe retailer. If you do get a blister, don’t pierce it, as it can cause infection. Take some time off running for it to settle down, and make sure you cover it with a plaster. If they start to bleed, they can take a few days to settle. A very common runner’s foot injury is Plantar Fasciitis. You’ll recognize it as pain under the heel bone. The pain does sometimes travel along the underside of the foot. Morning is when you often feel it the most, affecting your first step when you get up, but it can also affect you when resting. It is deceptive because it often gets better after walking, or at the beginning of a run. It is often caused by having tight calf muscles. But it can also result from high or low foot arches. Being overweight can have an impact, as can spending to much time running on hard surfaces. To help prevent it happening, regular stretching is a must. Regular sports massage will also help to loosen tight calf muscles and the surrounding fascia. First of all, stop running! Your sports therapist (physio, osteopath or masseuse) can show you appropriate remedial calf stretches. If it is slow to respond to stretching, you may be advised to wear a night splint, heel pads or insoles in your shoes. You should apply ice in the morning if it is painful, to reduce the inflammation. Use a foam roller daily. You may need a sports massage to release muscles tension and break down any scar tissue that might be exacerbating the problem. Furthermore, if symptoms persist, you may need to see a consultant surgeon. Usually, stress fractures will manifest as pain and swelling on the top of the foot. You will probably experience a localised burning or aching sensation somewhere along a foot bone. In particular, the area will feel sensitive to pressure. Even tying your laces could be uncomfortable. Ordinarily, the condition will worsen if you run. In essence, a stress fracture is a small crack in the bone, typically the metatarsals of the mid-section of the foot. This can result from impact, but can also come from repetitive movements, especially running and jumping on hard surfaces. The risk is greater when you do not take adequate rest between training sessions, or suddenly increase running intensity or distance. Therefore, you need to rest regularly, increase distance gradually, and create a proper training plan. A stress fracture can be one of the worst runner’s foot injuries. If you have one, stop running! See a doctor asap to immobilise the foot and arrange an X-ray or MRI scan. It could take several weeks before you are sufficiently healed to run again. Look after your feet, and you’ll get a lot more out of your running.